Charlie studied Ethnomusicology at Vanderbilt University, where he explored the music traditions of Ghana, Uganda and South Africa. In 2006, Charlie conducted field research in Khayelitsha, a township of Cape Town, South Africa, working with youth theater for development activists and learning gumboot or isicathulo dance. He earned an M.A. in Ethnomusicology at the University of California, Santa Barbara, where he played the ‘ud (Arab short-necked fretless lute) in the UCSB Middle East Ensemble, directed by Dr. Scott Marcus, one of the foremost scholars of the Arab maqamat system. In July 2010, Charlie traveled to Cairo, Egypt with the UCSB Middle East Ensemble to play a series of concerts at the Cairo Opera House. At UCSB Charlie performed, studied, and taught a wide array of music and cultural traditions, including Javanese Gamelan, Afro-Brazilian Samba, South African Zion Christian hymnody, Ethiopian Jazz, and the performance rituals of the Mardi Gras Indians of New Orleans. He currently performs in Austin with Atlas Maior and the Austin Global Orchestra, directed by Roberto Riggio. 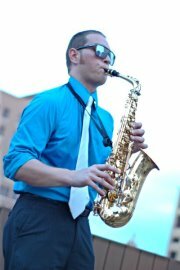 Joshua Thomson is a native of Detroit, MI and has been playing saxophone since the age of 9. 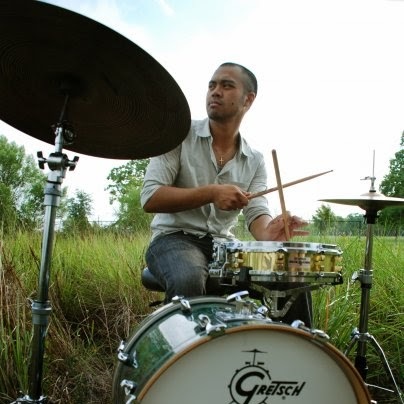 At age 17 Thomson began seriously studying jazz and chose to pursue a musical path throughout college. In 2003, Thomson began studying sociology and music theory at the University of Michigan-Ann Arbor. In 2005 Thomson conducted sociological research in the Dominican Republic. Thomson has performed at SXSW 2008 with showcasing artist Boubacar Diebate (Dakar, Senegal) and at La Merce 2007 (Barcelona, ES) with Ritmo Cartel. Thomson has studied with Detroit educators, Mikhal Caldwell, Ernie Mitchelat, Bradley Stern, Ben Janssen, Paul Vornhagen, Phil Whitfield, and Phil Lasley. Thomson has collaborated in various musical contexts including Arab, blues, electronic, experimental, funk, Latin, jazz, r&b, rock, and world music settings. Thomson has performed, and studied music in Canada, Dominican Republic, and Spain. While in Detroit, Thomson co-lead jazz fusion groups Aashram and Timecube. Thomson founded the jazz group Silver Phantom Quartet in Austin, TX in 2009. Since moving to Austin in 2008, Thomson has collaborated with a variety of national and international musicians. In August of 2009 Thomson co-founded the global jazz project “Atlas Maior”. This project has featured many talented Austin based musicians. Atlas Maior recorded their debut EP in 2011, and recently released 2012’s full length album tited “Four Shades” which has been featured on national airwaves throughout Texas, California, and Michigan. Thomson has become a coveted side man for studio recording projects and live performances. Over the course of the last seven years Thomson has worked with: Marco Minnemann, Boubacar Diebate (Senegal) , Brehima Kouyate (Mali) Guillermo Anderson (Honduras), Roberto Salamanca (El Salvador), Romúlo Castro (Panama), Mauricio Callejas, Willie O’teri and WD-41, Roberto Riggio, Jimmy Pitts, The Fractured Dimension (Missouri), Cilantro Boombox, Layalina, Son de Rey, Austin Global Orchestra, East Austin Blues Syndicate, Julie Slim-Nassif, Gary C. James, Layalina, The Mike Leonard Band (Detroit), Bob Sworaski (New Jersey) , Fared Shafinury, Shankar Bhattacharrya, Mohadev Bhattacharrya, Donald W. Mohr, Victor Murillo (Ecuador), Cierra Jesperson, Joe Deninzon (New York), Omar Taji, Eric “Fil” Fillip, and El-Mahdi “Nylez” Ahmed.